If you have spent any amount of time within the “paleosphere” you would have heard the virtues of bone broth extolled over and over again. This is not without good reason. It has incredible healing properties for the gut, joints, and bones. It is also rich in minerals that we rarely consume in our westernized diets. Even with all the good press surrounding bone broth, few people really take the time to make it and consume it on a regular basis. Recently on an Underground Wellness podcast, I listened to an interview with a chef in the San Diego area who makes huge batches of bone broth and sells it in local markets. So naturally, I knew at some point I would have to pick some up. The Flavor Chef’s free-range chicken bone broth was waiting for me at Seaside market in Cardiff. This broth is high quality and NOT INEXPENSIVE, but making your own broth is VERY INEXPENSIVE so I encourage you to use your google search button to find some great bone broth recipes. 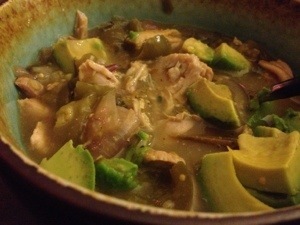 You can make it over the stove or in a crockpot and use multiple kinds of bones. Give it a try and use some in your next homemade soup! Place tomatillos, red onion, and garlic on a baking sheet and bake for about 20 mins, until soft and beginning to brown. In a medium pot, heat some coconut oil and sear the chicken thighs. Add peppers and spices. 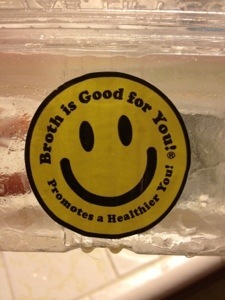 Then add broth. 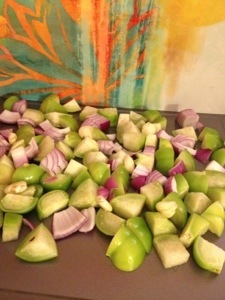 Add tomatillo mix when done roasting and add lime juice. Let soup simmer until chicken begins to shred easily. I had the privilege of Nikki personally making me this dish. It was BEYOND insane and I could not get enough of it!! A MUST TRY for all! !